Whew. What an amazingly busy few days! It never ceases to amaze me that no matter how on top of things I am, there’s always room at the top for things to get over my head. Busy, but good. 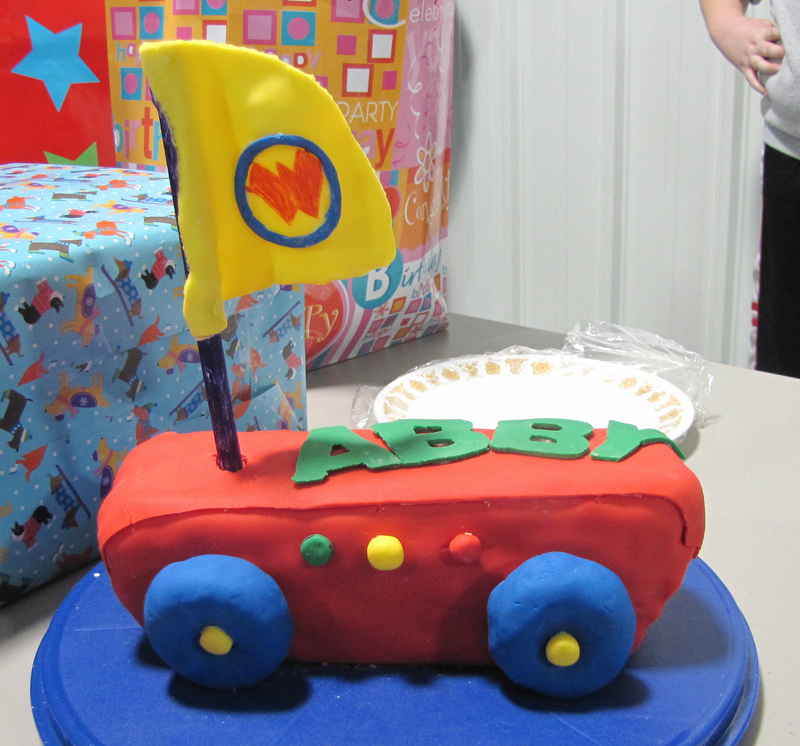 Daughter’s birthday party went as good as we could’ve hoped and the Wonder Pets Fly Boat cake turned out great! Not to mention we got an extra special blessing from God :D The night before birthday party day, it snowed between four and six inches. Our road is treacherous (husband wrecked last month trying to go down our hill!) and husband spent a couple of hours (fo’rilla!) shoveling and salting the hill so that we could make it to the party. The venue having her party had two other parties scheduled for the same time as our party…that cancelled! So we had the whole place to ourselves–now if that isn’t God working everything out for our good, I don’t know what is :) It was a blast. That pierogi dinner I mentioned in the last blog did not turn out so awesome, haha. It was certainly nothing to write home about: very bland and ho-hum, but dinner nonetheless! Now, onto the juicy stuff, the fondant cake! With the help of some old college friends, we turned it out. 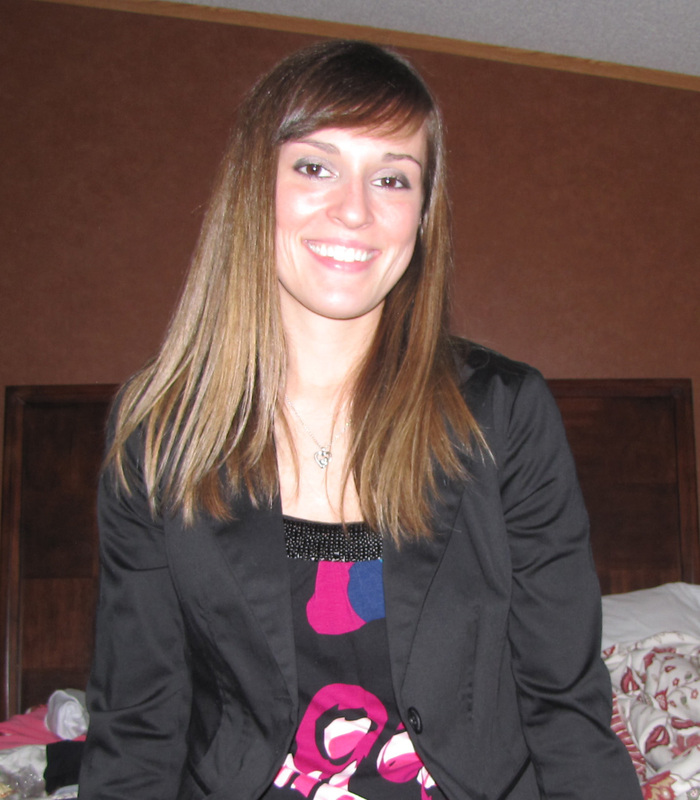 Here is the finished product :) And a fun little editing project too! 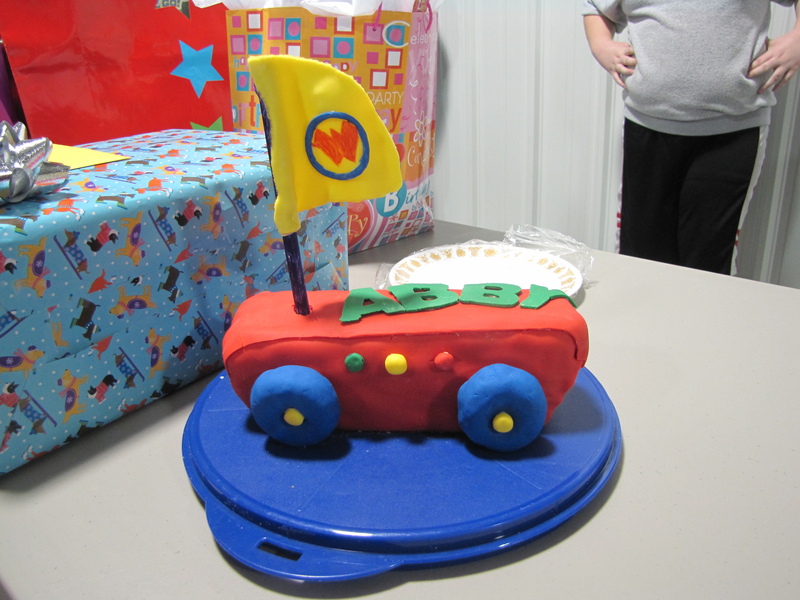 Working with fondant was a little intimidating at first, but once I actually dug into, it really wasn’t that bad. I’ll do my best to take it step by step! I bought the pre-dyed fondant since there were so many primary colors involved. I bought three boxes of it–and I definitely could’ve used more. Buy enough fondant! I also made the pound cake version of the boxed cake that I bought; that recipe was on the side of the box (it was lemon, yum!). If you want to buy a boxed cake that doesn’t include pound cake directions, you can google “dense up a cake” and find lots of ideas for doing so (adding an egg and box of pudding were the most common). 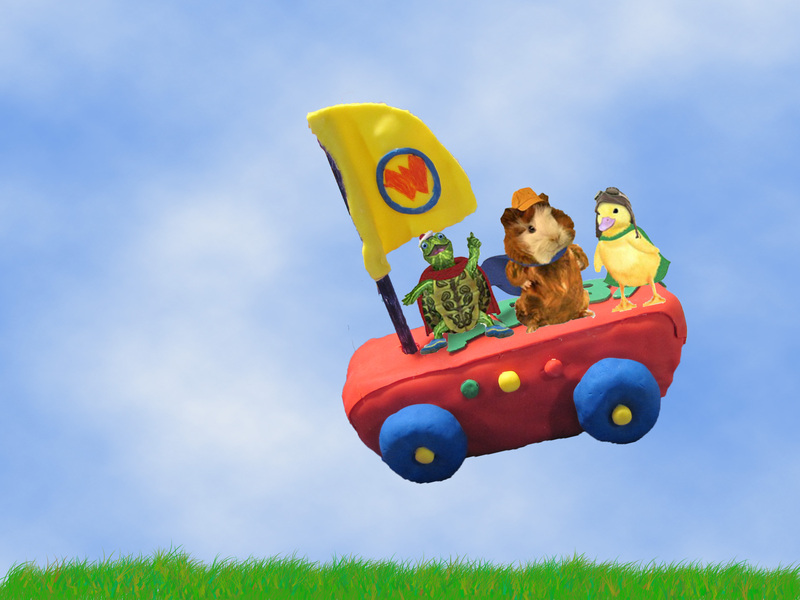 I used donuts for the wheels, toothpicks to stabilize things, and some Pick Up sticks to skewer the wheels to the boat (toothpicks weren’t long enough). I’m going to tell you what we did, and also what I would differently. Considering that this is the first time I’ve ever made a boat cake, it was very much a learn by doing and making mistakes kind of thing. I bought chocolate donuts to use as wheels. This part was surprisingly easy! Just roll out the fondant and cover. Leave enough overhang to cover the donut (or whatever) completely. Pinch and smush the corners as best you can and voila! I made two 9-inch round cakes and cut one in half. 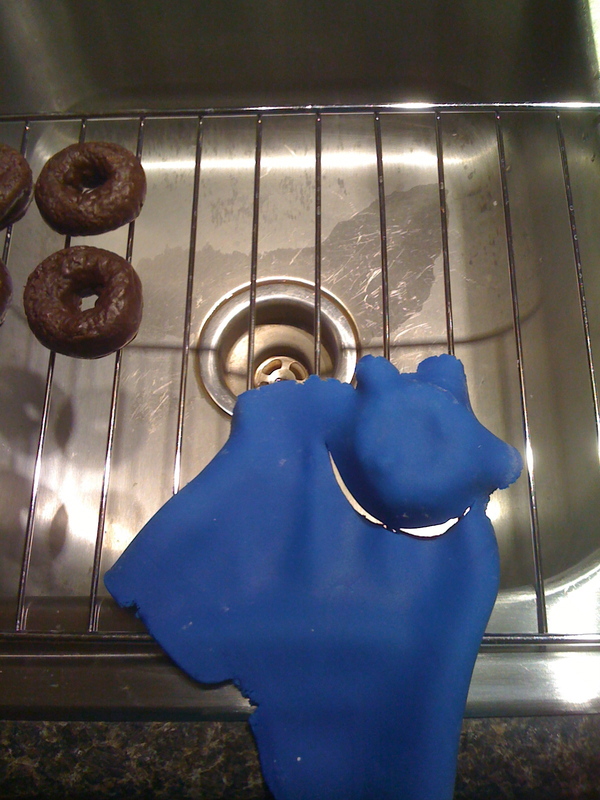 Icing is your friend when working with fondant; it’s like glue and it’s great. KG, Q, and I then stacked the two halves and stuck lots of toothpicks into them to hold them together once it was turned on its (curved) side. Note: At this point, I would’ve also cut off a little piece off the rounded bottom to give the boat a flatter surface to stand on. 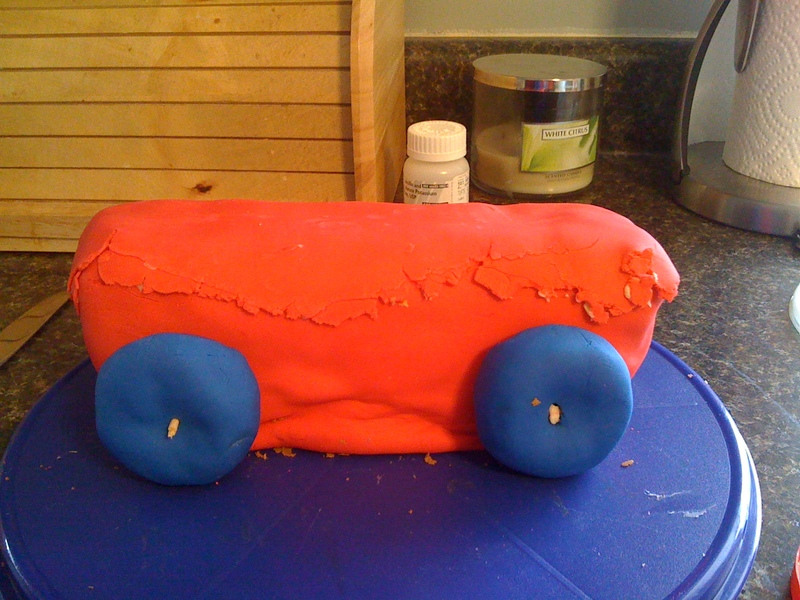 Which I actually ended up doing after the cake fell over on the ride home after it was already covered in fondant. Live and learn. Ice the cake. 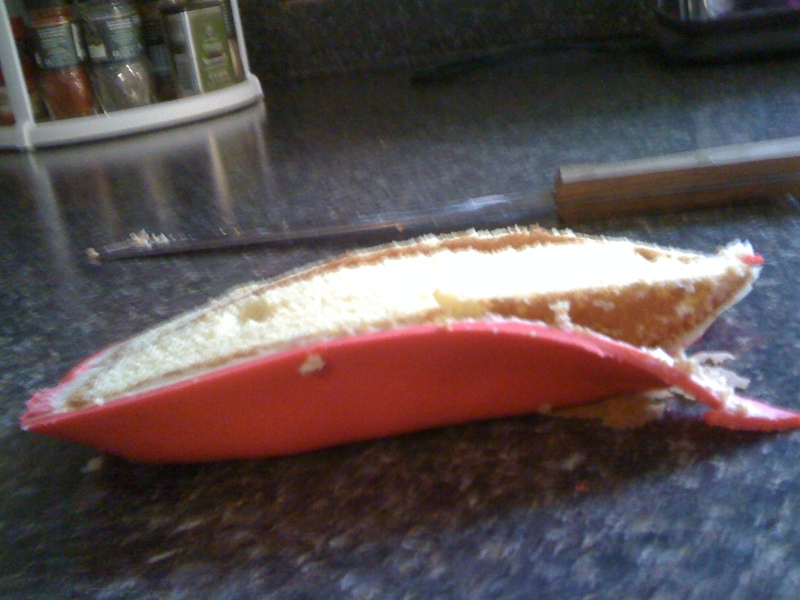 Don’t go crazy with big gloppy lumps everywhere, but cover the cake as well and as smoothly as possible. 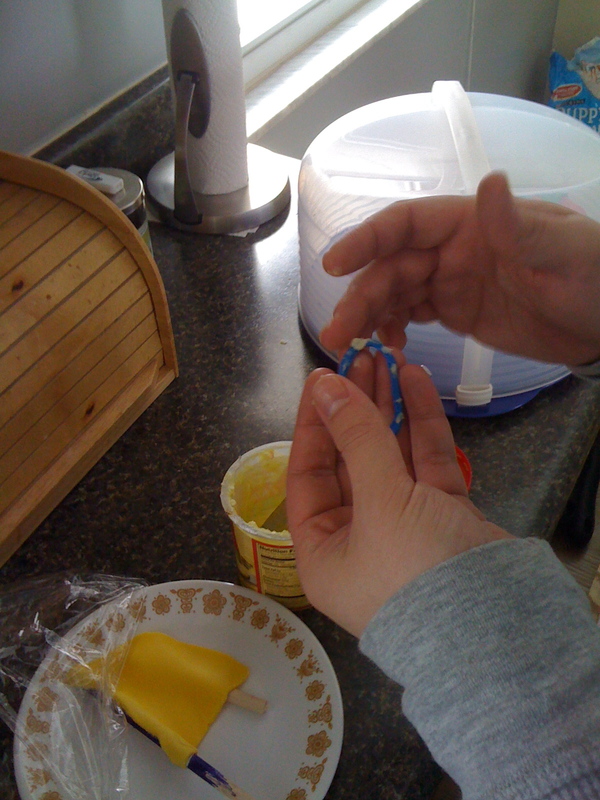 We used butter knives, so while fancy equipment may be fun, it’s not always necessary. 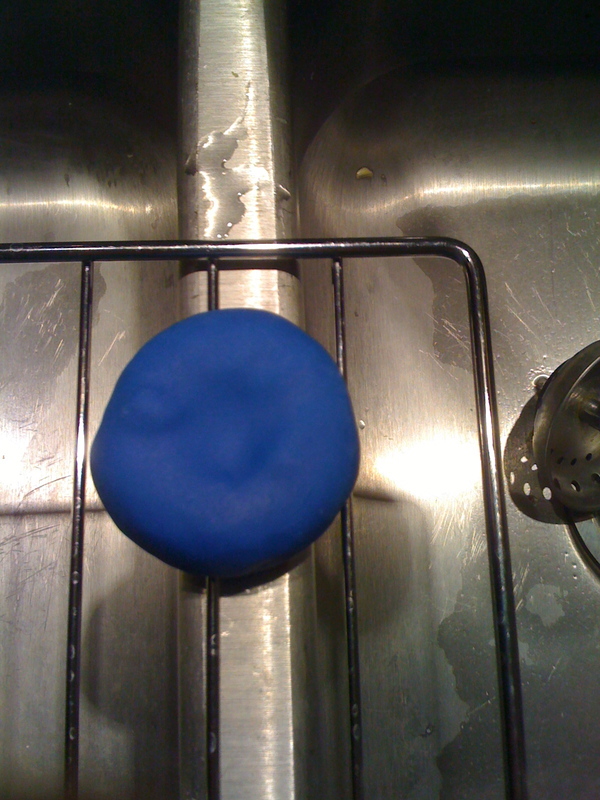 Roll out the fondant on a clean, dry surface. Q and KG just used the countertops, but if you run in to trouble with the fondant sticking, use cornstarch. It dusts the fondant a little, but you just dust it back off with a paper towel or something; I didn’t notice it affecting the look at all. Roll it large enough to cover your entire cake, if possible. We ended up having to piece a few parts together, and while it was fine, I would try to do get it all in one piece in the future. Place the fondant on top of the cake! Do the best you can getting it smoothed out. I’m sure you’re probably not making a Fly Boat, but I’m sure one side will turn out better than the other and that can be the front :) At least that’s what happened to me! 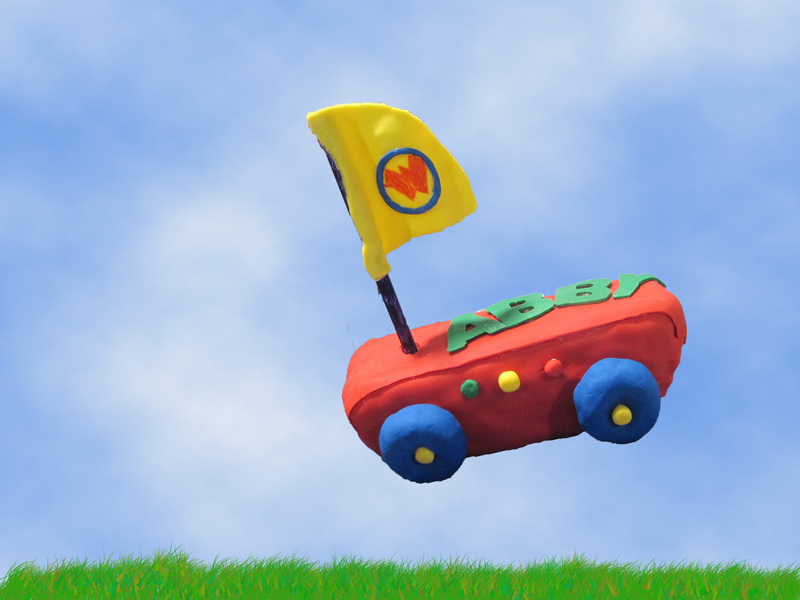 The flag. Pretty crucial for the Fly Boat cake, right? I bought some craft dowels to serve as the mast and colored it with a magic marker. I rolled out some fondant and cut a sail shape out (free hand, what what!). 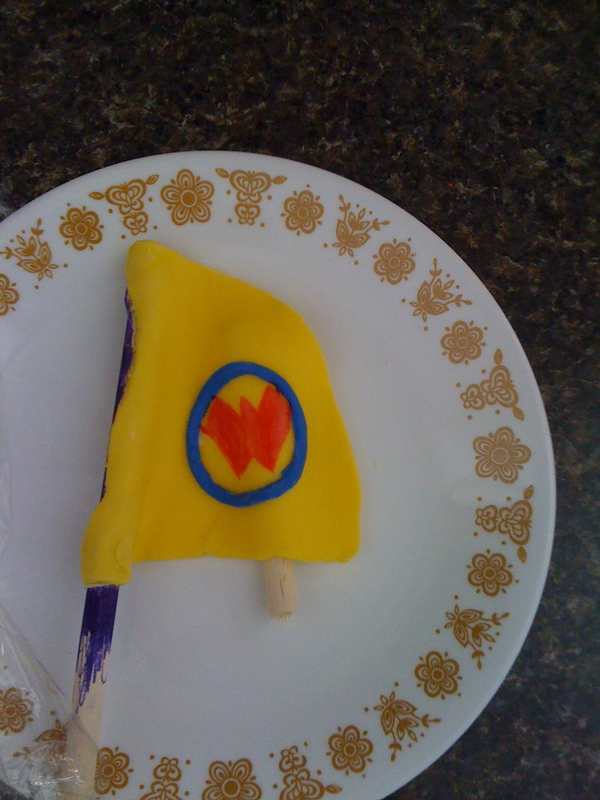 I iced the dowel and wrapped the fondant around it. I then sawed one in half and stuck it under the fondant sail to give the sail some ‘movement’ and let it harden overnight. Worked great and achieved the desired effect. 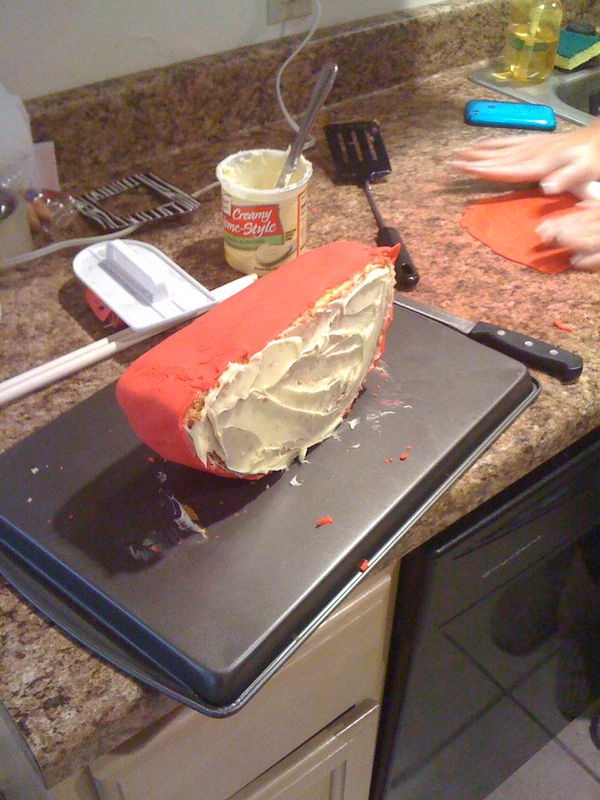 It’s hard to elaborate because like I said, we did things kind of backward: like putting the fondant on while it was still lying on it’s side, thus covering the bottom (not necessary) and leaving one side exposed (hence the piecemeal effect). The actual draping of the fondant wasn’t hard. We had some cracks on the ‘bad’ side and some others that I creatively covered up by using fondant cut out in letters (they were refrigerator magnets!) spelling daughters name. Remember! Icing is your friend! ‘Glue’ everything! Don’t use so much that it squishes out from underneath though, a little more than a dab’ll do ya.